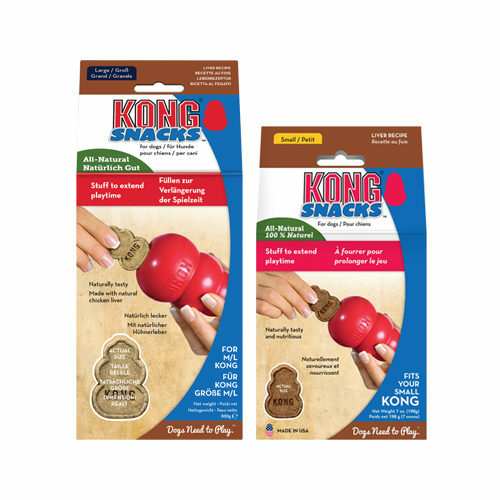 KONG Stuff'N Liver Snacks are tasty rewards for your dog's KONG toys. The snacks have a tasty liver flavour and are made from high-quality natural ingredients. Available in two different sizes: small and large. The Stuff'N Liver Snacks from KONG are tasty rewards for your dog, made specially for use in the KONG Classic, Extreme or Wobbler. The snacks make the game into a party and are made from high-quality natural ingredients. Stuff'N Liver Snacks have a tasty liver flavour, making them irresistible for many dogs. Of course these treats are also suitable for use without a KONG toy. Available in two sizes: Small (suitable for small and medium KONG toys) and Large (suitable for large and extra large KONG toys. Whole-wheat flour, oat flour, chicken meal, chicken liver, canola, carob tree powder, mixed tocopherol. Have you used KONG Stuff'N Liver Snacks before? Let us know what you think about this product.